NSW led from the start and got a good lead of 3/4 length by the 1000 metre mark. A push by the Victorians in the third 500 metres got the two crews level but NSW sprinted well in the concluding stages and went onto win with a comfortable three second margin. 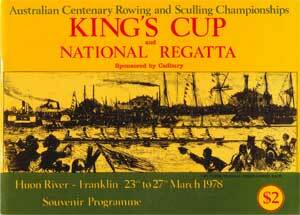 NB: Up to 3 scullers per State were allowed and semi finals included for the first time. Hale led all the way with the battle for second place the big interest in the race. McGowan and Reddell had a great battle with McGowan prevailing in the end by 1.7 seconds. Victoria led all the way to win convincingly for the eighth win in succession. Tasmania led all the way and only had to fend off one challenge from SA to win by a margin of 4.2 seconds.